Our focus is on two, all-inclusive guided tours for small groups, which combine the best aspects from nicest activities to delicious local foods, from authentic accommodation to actually participating and learning about a way of life as you´ll be visiting our private reindeer farm and enjoying the Finnish sauna on a daily basis during your stay. You´ll get to do all the must do-activities in Finland, but also connect with the local people whose traditional trades and inherited skills define local culture in the most personal terms. Check out our all-inclusive, multi-activity tours for both summer and winter seasons or request a tailored proposal! How about sleeping in a wilderness cabin with your own fireplace giving you heat and feeling the “steam” of a traditional wood-heated sauna, rather than staying in a boring hotel room? Authentic setting and a simple, yet cozy accommodation is a solid part of the business and all the lodgings that are used are locally owned, keeping life vibrating in the communities. 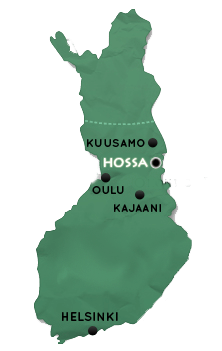 With Hossa Travel, you´ll dive beneath the surface and get off the beaten path. This means that you´ll do stuff that other travelers might not – taste local specialties picked and collected by your guide, take part in seasonally varying nature activities, stay at locally run places and even spend a night or two out in the wilderness. Beside all this, you´ll get to explore the ‘must-see’ sites of this area and have plenty of time to do your own thing. This allows us to gain access to sights and experiences inaccessible to larger groups and makes it easier to react to individual desires and requests. The pace, amount of activity and the degree of challenge are yours to decide. This is why couples, groups of friends, families, schools, clubs and charities have the chance to create an individual package. Every detail will be taken care of so you can focus on the essential. This includes all meals, accommodation, equipment rentals and transfers from airport to airport when necessary. The value for money works both ways: You´ll get to explore something exclusive whilst this small community benefits directly from your visit, the money stays here and allows local people to keep doing their own thing in their home village.